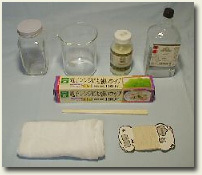 This page teaches you how to make Dammar Varnish. You can use Soft Resins such as Damar or Mastic by dissolving them into Turpentine. The rate of Resin and Turpetine depends on uses. Generally, Dammar 1 to Turpentine 2 is popular (for example 200ml of Turpentine and 100g of Dammar). You can use Alph pinen or Petrol insteed of Turpentine. But the dissolving ability of petrol is weaker than Turpentine. Sometimes Petrol doesn't dissolve Resins perfectly. You will need below materials and tools. 1. In advance, break larger dammer gums into the length of 1 or 2cm. 2. Pour Turpentine in the beaker. 3. Wrap Dammer gums by Gauze, and tie it by thread to make a sack. 4. 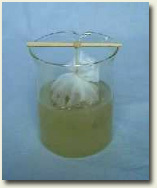 Hang the sack of Dammer from a stick hanging over the beaker like below pictures to soak the lower half of the sack into Turpentine. 5. Cover the mouth of the beaker by clear-plastic wrap, and make it airtight perfectly by Scoth tape, because Turpentine vaporizes into the air soon. 6.Resin may start to dissolve into Turpentine soon. After a night, remove the vacancy scak of gauze. And pour Dammer virnish you've just made into a vacancy bottle and cork it.